Bill and Melinda Gates deliver a stirring address on optimism to Stanford University’s 2014 graduating class. How do you inspire a group of unusually smart, hard working, optimistic, and largely privileged youngsters who are already destined for success? Encourage them to learn from those most in need; urge them confront inequity; exhort them channel their optimism with empathy; oh, and remind them that for all their accomplishments, they wouldn’t be where they are without a heavy dose of luck. 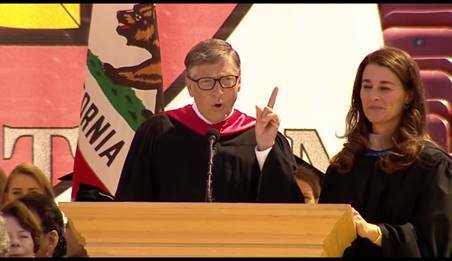 That was the message that philanthropists Bill and Melinda Gates delivered to Stanford’s 2014 graduating class in a poignant commencement address. Optimism for me isn’t a passive expectation that things will get better; it’s a conviction that we can make things better—that whatever suffering we see, no matter how bad it is, we can help people if we don’t lose hope and we don’t look away. Let your heart break. It will change what you do with your optimism. Bill worked incredibly hard and took risks and made sacrifices for success. But there is another essential ingredient of success, and that ingredient is luck—absolute and total luck. The talk may well join another Stanford commencement address—the classic 2005 speech by Bill Gates’ longtime rival Steve Jobs—in the ranks of the most memorable ever. And it seemed especially apt for Stanford, a university that is minting innovators and entrepreneurs are an unprecedented rate. But not all successful Silicon Valley enterprises are created equal, or as the investor Peter Thiel famously bemoaned, “we wanted flying cars, instead we got 140 characters.” Stanford, for example, recently spawned the likes of Snapchat – disappearing messages—and Theranos—a potential revolution in healthcare. Both are successful and both are worth billions. But there’s little doubt as to which one Bill and Melinda Gates think Stanford graduates should join or try to emulate. Get inspired and watch the full address below (Gates’ storybegins at 1:10.50).